Originally, I was going to write about lingerie dresses in general, as they make up a large portion of heirlooms everywhere, and especially of my small collection of antique clothing. But then I remembered - I can do better! Ardis kept this dress and passed it down to my grandmother, who passed it down to me. 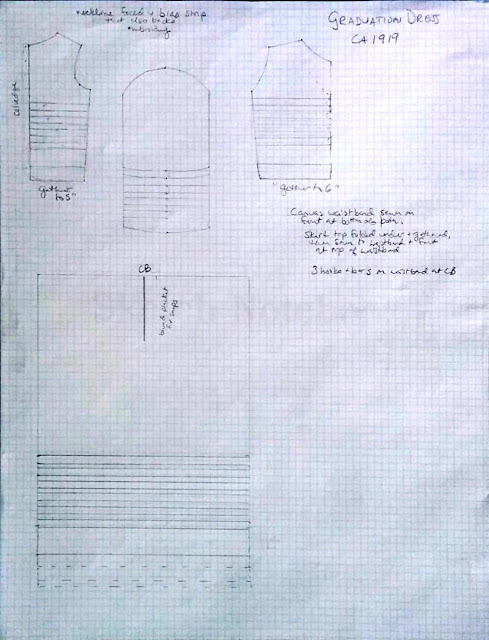 Unfortunately, I can't display it for you as I don't have a dress form that's small enough, but we have the two photographs above - and I'd like to share the pattern with you. The extant dress has a waist measurement of 23", which few of us do today, even in a corset that's more curvacious than those of 1919 - but on the positive side, these pieces would be relatively easy to enlarge because they're so loose and gathered. To view at original size, right click and save as or open in new tab. The dress is made of a smooth batiste and the construction is fairly simple. The sleeves and the bodice are seamed and then tucked as shown, then put together, and the skirt is tucked after the side seams are sewn as well. (The front of the skirt is the same as the back, but without the slit.) The first two dashed lines under the bottom edge of the skirt represent a hand-sewn tuck, and the last dashed line is the edge of the hem. Bodice seams are French seams; the skirt pieces are cut from a full width of the fabric and the seams need no finishing. The bottom of the bodice pieces are gathered and a 23" long, 2" wide, very stiff white canvas waistband is sewn down on top of them on the bottom edge and at the solid line above it. The skirt is then turned in at the top, gathered, and sewn down at the top of the waistband. All of this is not very neat, but there was a sash worn with it originally that hid all of it. The back of the neckline is faced with a bias band. The front is faced with self-fabric within the dashed lines - the embroidery goes through it, and it's trimmed close along the edges. 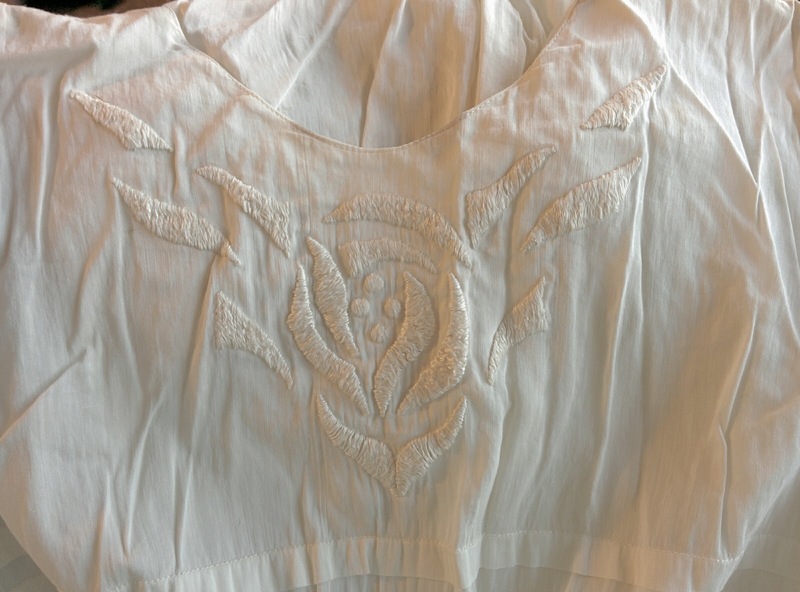 I didn't pattern out the embroidery, but there's a photo below. It's done with a thick, coarse silk thread as padded satin stitch, a very common material and technique during this period. The center back opening has a half-inch strip added behind the left side of the bodice back as reinforcement, and a placket of the same width added to the right side, where it folds under - before the waistband is put on. The skirt slit is finished with a continuous half inch placket, also before attaching to the waistband. In the end, the bodice fastens with seven fairly large snaps, the waistband with three hooks and bars, and the skirt with three snaps. I enjoyed reading this. The dress looks almost easy enough to make. Except for that embroidery. Grandma did look lovely in it! It's just too bad that, stylistically, I'm not sure it would fit in at a 1910s events or a 1920s event! 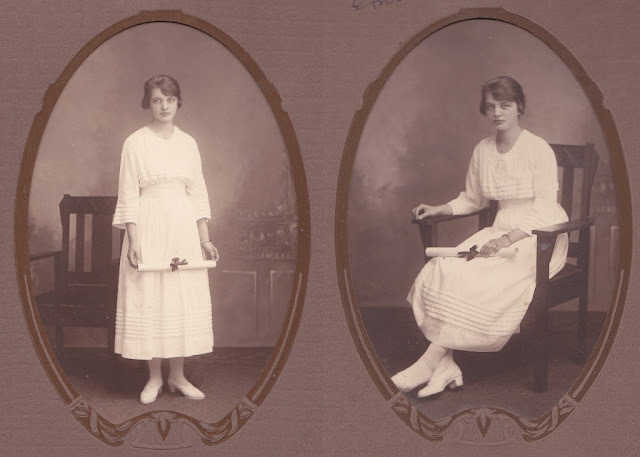 When I get back to town I'll dig up photos of my grandma in her dress for, 1918, which looks very stylistically similar to these. I'd think any WWI event would work! Oh, great! Was that when she graduated? I'm not entirely sure, but she married my grandad about then, and my mom and her twin brother were born in 1920. I'll see if I can email you some pics.